First off I need to go ahead and state a fact, as I see it-All But Gluten has to be the best gluten free products I have tried to this date. I have tried lots of gluten free products and found them rather BLAH! But Gluten has truly met its match in All But Gluten! It's so rare that I have been truly blown away with a product much less with all the products that a company have sent me but I am. All the products were fresh, true to flavor and just YUMMY! No one in my family has a gluten allergy, but you do not have to be on a gluten free diet to enjoy these yummy treats-all you have to be is hungry! I am a fan of these products. Not only are the gluten free but also kosher, dairy free, and made in the USA, too. Definitely check them out! Buy It! Unfortunately, All But Gluten products currently are only found at Safeway stores in Northern California in the fresh bakery section. But contact your local retailer to inquire about the availability of your favorite styles and flavors because maybe they'll be in your store, soon! All But Gluten also has a page just for Gluten FREE recipes. Welcome back to the bakery section. Yummy bakery goods – all gluten-free. You’ve heard this before right? 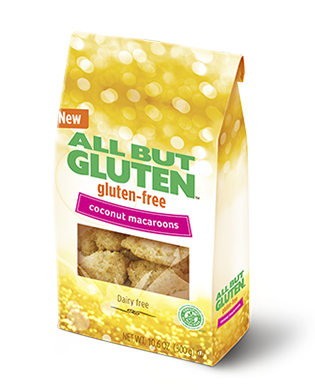 Just try All But Gluten™ products to taste the difference. Brownies and macaroons you can’t tell from the regular kind. Imagine serving a treat everyone can enjoy and nobody realizing they are gluten-free. That’s freedom! Healthful bread loaves like gluten-free whole grain and cinnamon raisin – that you’ll never want to give up! Try our moist white bread loaf for a clean gluten-free taste experience. Takes a little longer to toast, but worth the wait. 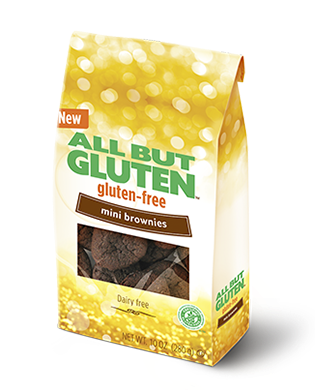 The All But Gluten™ products are made in facilities that have been certified to produce gluten-free products. The North American production facilities are dedicated, gluten-free facilities that have been certified by the Gluten Free Certification Program as endorsed by the National Foundation for Celiac Awareness (NFCA). 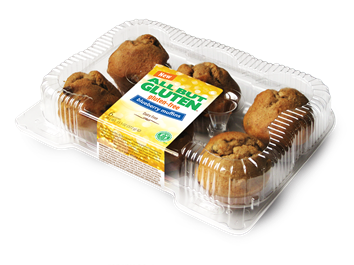 The products imported from Europe are produced in facilities that are certified to be gluten free by the country specific Celiac Society. Live the life you want - without compromise All But Gluten™ products bring life back to normal – now you can enjoy baked goods that taste like traditional products. Rekindle your love of baked goods with All But Gluten™! 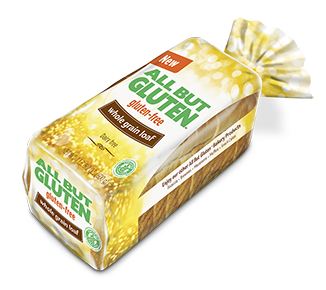 Unlike other gluten-free baked products, which are usually sold frozen, you’ll find All But Gluten™ in the fresh bakery section. Why? Because we think you should enjoy our breads and sweet goods as soon as you buy them and we think they taste as good as the bakery goods you used to love! So go ahead, take a stroll down the bakery aisle – you deserve it!